Standing on top of the highest peak in the Santa Monica Mountains, breathing in the high elevation air looking over the horizon, one feels free as a bird. Sandstone Peak, also known as Mt. Allen, was given its second name by a group of Boy Scouts in the 1960s. In an attempt to honor Circle X benefactor Herbert Allen, the Boy Scouts petitioned the United States Department of the Interior for the name of the summit to be changed. Although they were denied, the Scouts held an unofficial dedication ceremony for their leader. The peak is part of the Circle X Ranch, a former Boy Scout camp of the western Santa Monica Mountains, an area that is administered by the National Park Service and part of the Santa Monica Mountains National Recreation Area. Today, a plaque stands on the summit honoring Herbert Allen. “The Mishe Mokwa Trail to Sandstone Peak is that rare trail that you can do over and over again and never get tired of,” says Founder and Editor-In-Chief of Modern Hiker Casey Schreiner. “Depending on the season, the weather conditions, and the time of day, this trail will highlight new and different aspects of a route that has a little something for everyone. 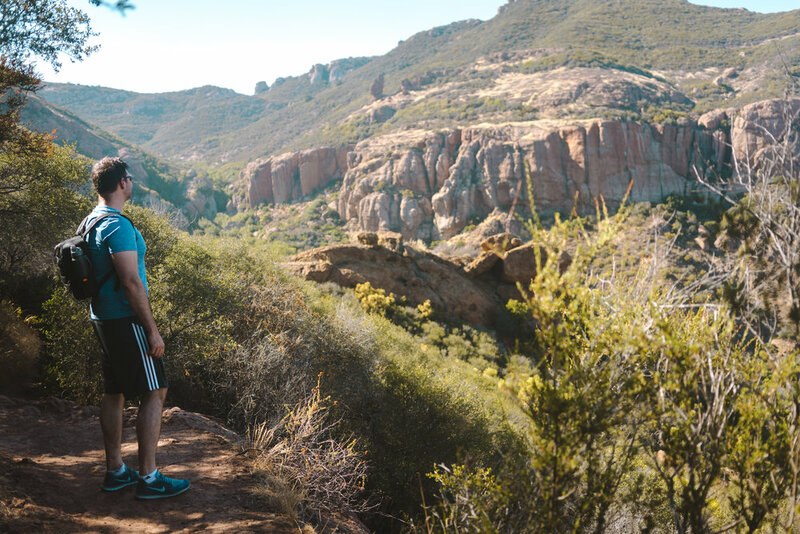 This particular trail is hands down my favorite hike in the L.A. area, and probably my favorite in California.” Located in the Santa Monica Mountains near the border of Los Angeles and Ventura County, Sandstone Peak yields breathtaking views of the Pacific Ocean and San Fernando Valley. 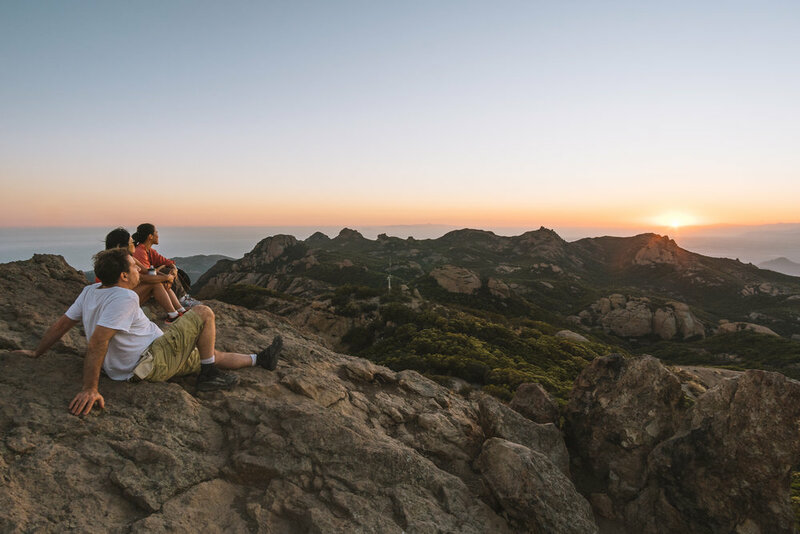 Hikers can choose between two main trails to the summit: the Sandstone Peak Trail, which runs 3 miles round-trip and has an elevation gain of 1,000 feet, or the Mishe Mokwa Trail, a 6-mile trip with an elevation gain of 1,400 feet. Parking can be found on Yerba Buena Road one mile past Circle X Ranch, with both entrances to Sandstone Peak trail head and Backbone Trail. After passing Circle X Ranch, hikers first see parking for the Sandstone Peak trail head. A couple of miles past lies the entrance to the Backbone Trail, which ultimately connects to the main Mishe Mokwa Trail. No fees or permits are required for this hike. Hikers are welcome to bring dogs but they must be on a leash and should have plenty of water for themselves and their furry friends. Coming in through the Mishe Mokwa Trail entrance, there is a map detailing the area with need-to-know warnings about wildlife and safety. Some of the ntive wildlife include bellied lizards, scrub jays, wild hares, quails, coyotes, and rattlesnakes. Remember to be mindful of poison oak and ticks and pack the essentials such as water, food, and sun protection. At the gate, the trail begins and continues steeply uphill. A couple of strides in, you reach the first fork in the road. To the right is the Mishe Mokwa trail and to the left the trail leads you directly to Sandstone Peak, which is just a little over a mile away. Mishe Mokwa Trail is a loop which also leads you to Sandstone Peak. Although it’s the longer of the two options, the surroundings make it well worth it. Staying to the right down Mishe Mokwa, the trail winds along the mountains with a magnificent glimpse of the valley that seems to extend further from view. At roughly the mile and a half mark, you can look across the valley and see daring sandstone cliffs named Echo Cliffs. These cliffs are a popular spot for mountain climbers, and you may even catch a few making their ascent. At the northwest end of the cliffs, you can spot the Balancing Rock, large piece of rock that seems to be floating on a smaller rock below. Winding down the trail, you eventually reach a low-point known as Split Rock. Split Rock is another great boulder visible on the hike, this one split into three pieces with one of the cracks so big you can walk through. Split Rock also includes a picnic area and after nearly two miles, this is an excellent spot to take a break in the shade and recharge. Just beyond the picnic area, you will see signs for two side trail options. The first is an out-and-back trail which leads you to a closer look at Balancing Rock. If you continue along the trail, around the three-mile mark you will come across another junction with signs to the second option, Tri-Peaks.